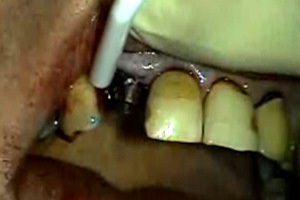 In this course video restorative dentist, Dr. John Levy, and periodontist, Dr. Michael Wiener, demonstrate team-work to restore a case in a single visit. Dr. Wiener replaces tooth #7 and #10 with immediate load implants while Dr. Levy will demonstrate the use of CAM/CAD technology to produce an implant abutment and a porcelain crown that can be placed during the same visit. 1. Describe the patient benefit of using immediate load implants. 2. Discuss placement of implant protocol. 3. List advantages of using CAD/CAM dentistry on an immediate load case.